Technology to the rescue! No more impressions, no more goop in your mouth, no more gagging, and no more temporary crowns breaking off one hour after you leave the office. Introducing the CEREC 3D from Sirona. This CAD-CAM (computer aided design-computer aided manufacturing) device allows Dr. Wagner to make beautiful ceramic/porcelain restorations (crowns, inlays, and onlays) in about an hour. Each restoration is beautifully matched to the color of your natural enamel. This technology allows Dr. Wagner to increase the strength of the tooth, and in particular, be more conservative with the removal of tooth structure. After all, in light of today’s technology, it’s not really how much tooth structure you remove – it’s how much you save! We understand the inconvenience patients face with a traditional crown, and because your time is as valuable as your smile, our team now uses a revolutionary tool that mills the final crown or onlay in about an hour. No more second visits or temporary fillings. Get more work done in less time and get healthy faster! 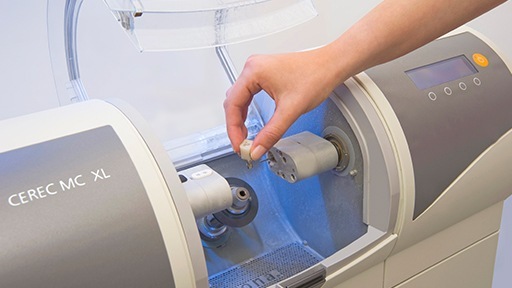 After taking a 3D image of your tooth, our CEREC machine can mill a strong, beautiful restoration in about an hour. Dr. Wagner will permanently place the crown during your single visit, and you'll leave our office with a full, healthy smile. CEREC restorations are milled out of a solid block of ceramic-reinforced porcelain. Prior to being bonded to your tooth, this material is fragile like fine china. However, once bonded to the tooth, its properties change and it becomes a very strong, long-lasting, and beautiful restoration. CEREC restorations are backed with 20+ years of research. Dr. Wagner has restored thousands of teeth using this technology with incredible results!